Conventional underground mining methods are predominantly used for Sylvinite potash mines throughout the world. The mineral Carnallite is deliquescent, with the ore absorbing moisture from the atmosphere. This tends to weaken the structural strength of the ore body, and renders it unsuitable for conventional mining. However, Carnallite’s deliquescent nature makes it ideal for solution mining extraction. Karnalyte plans to use a proven dual well solution mining process developed in Germany. Two boreholes are drilled to the base of the potash deposit. An oil control blanket is established to ensure horizontal dissolution. Water is injected underneath the targeted layer until the boreholes are interconnected. 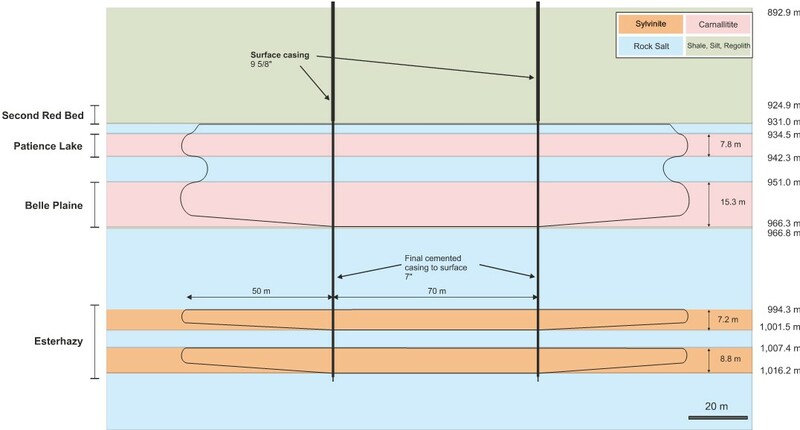 At this point the oil control blanket is raised to allow mining of the potash bearing zone. With dissolution rates 5 times faster than salt, hot water will preferentially dissolve carnallite over salt.